St Teresa's Ravenshoe is a Catholic primary school catering for boys and girls from Prep to Year 6. At 920 metres above sea level, Ravenshoe is Queensland's highest town and is situated 147 kms south west of Cairns. It is surrounded by World Heritage listed rainforest and boasts distinctly beautiful wildlife, birds and many tourist attractions. St Teresa's has an enrolment of 102 students and a staff of 20. Our website may be the first point of contact for information about our wonderful school, but there is nothing quite like exploring the real thing. Please contact us and we would be delighted to arrange a time to show you around. ANZAC Day falls on Day 3 next term; April 25. We will join the march through the town to the commemoration ceremony and more details will be sent home early in Week 1. We have decided that due to the short week and our only returning on Tuesday, that we will have a whole school Mass on Thursday, May 2. This special time will allow us to link the intrinsic message of Easter with ANZAC Day. Just as Jesus gave his life for us, so did these brave men and women whom we honour. Mass will be at 9am and you are very welcome to join us if you can. Have a wonderful holiday with your families and we look forward to seeing you next term as we continue our learning journey. May the peace of the risen Jesus be with you and remain with you through the rest of the Easter Season and indeed, throughout the year. The times for Easter liturgies at St Teresa’s Church are available via the link below. Please consider taking your children to one of these beautiful liturgies this Easter. Our team will attend a Regional Competition in Cairns where they will be quizzed on all 6 titles. The winning team goes to the state finals in Brisbane to represent their region. 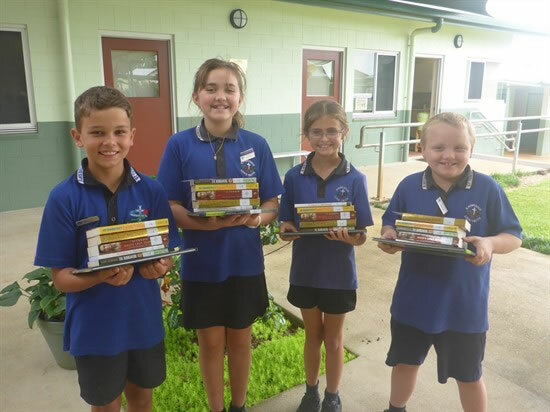 Reading started on Monday the 1st of April and our team will work hard at reading, discussing and studying the books until the finals which will be held at Redlynch State School, Cairns on Thursday the 13th of June. A big THANK YOU to our school P&F as they purchased four copies of each title so that our team members each have a copy to read and study. Our Cross Country is on the last day of Term 1 Friday April 5. Students can wear their coloured joggers with their coloured shirts to represent their team. Wattle is gold, Cedar is red, and Oak is green. Students score points for their team and at the end of the day points are tallied up and the shield is up for grabs. Full details are included in our latest newsletter.